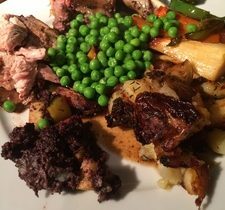 We have found this amazing recipe for Roast pheasant with a black pudding an apple stuffing from Game to Eat. A perfect meal for a cold night. For more great ideas and ways to use game visit their website. Stuff the cavity full of the mixture and close up the legs to keep as much as it in as possible. Smear healthy hunks of butter in between the skin of the pheasant and the breasts keeping them nice and moist whilst cooking. On the outside cover the skin in all the wonderful seasoning that you so desire, but always plenty of salt! In the pan add a few onions and garlic to help with the gravy at the end. Some people like to pan fry the pheasants before placing them in the oven. However I am a fan of blasting the pheasants at a high temperature for five minutes (220oC) and then turning it back down to 170oC for 20 minutes. This way the skin crisps up and keeps the most of the juice in the breasts. Once done take out the oven and leave to rest for at least 15 minutes. This will allow the meat to cool down and the muscles to relax making it a far nicer meal. Use the juices that manage to escape from the birds in the gravy and serve with whatever vegetables you so desire. We enjoyed some smashed potatoes, roast carrots and parsnips and some peas.